Home / 40k / Choas / Iron Warriors / iWarhammer / Iron warriors and austere chaos. 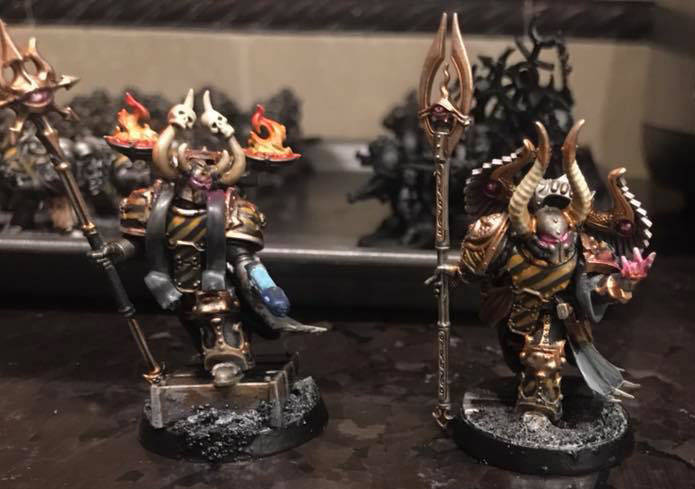 So in my opinion of the chaos legions, Iron Warriors are not fond of being lost and damned. I am not telling you how to build yours but mine are a warband that rejects the “gifts of the dark gods” and generally hates warp born mutation(with occasional exceptions). I generally model them as renegade astartes. however I do acknowledge the legion’s bitterness and hatred so my war-band are not “good guys” and I don’t see them as such.I also recognize that despite their outward apearance and desire to matian a certain level of functionality, the gods have hold on them, particularly, slaanesh(pride, arrogance, excess) and Khorne(valor, bloodlust, battle, etc) so I am not saying they are just somehow pure “snowflakes.” Just not as far gone as honsous men. Iron Wariors run the foundaries of chaos as such I would suspect that despite the warp’s influences they are often not as mutated, possibly generating a sort of singularity of non mutation in the warp. Otherwise how would they reliably construct anything with any sort of regularity. So I suspect between them and the “dark mechanum” there is enough concentrated force of will to create a “bubble” to some degree and evoke the warping forces of the warp as needed. 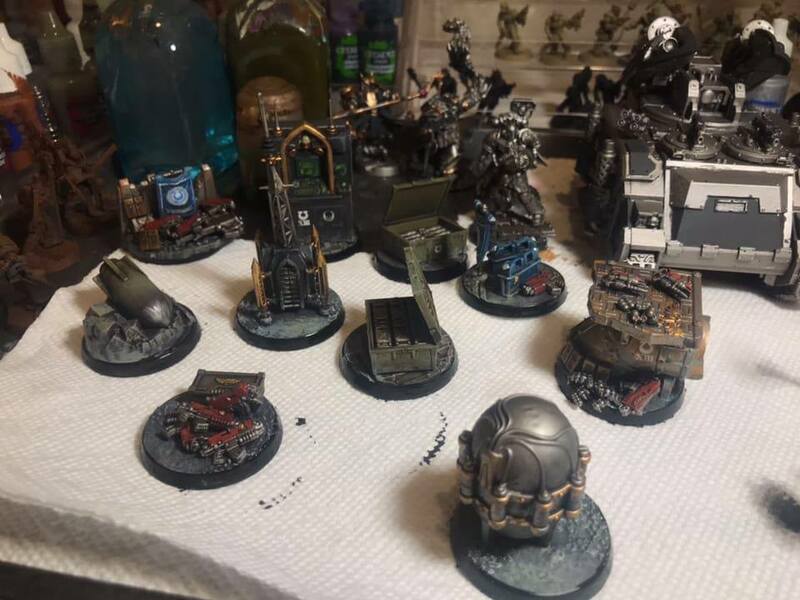 Even going so far as to make objectives that reflect their scavenger nature as chaos has a constant demand of supplies from medrengard. However, despite my warband’s pride and will, they do have equipment breakdowns and supply issues. The IVth has been a supply line legion since their conception. With their heart and soul revolving around the creation and maintenance of equipment. As such most of my war band does not have a lot of MKVII armor but will occasionally make use of anvilus(see this great blog post on em) power units(backpacks with the little thrusters_ and sometimes MKVII legs and arms as needed. However, the majority uses MKIV and MKIII power armor marks as they get them. 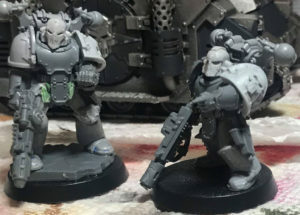 So the majority uses the old armor and weapons from the heresy era. However, prized objectives are astarties weapons that have not had chaos influence and while they do not particularly care for the “baroque” styling other legions have adopted, they will occasionally use these parts for repairs as needed. The MKIII helmet is of course given priority. OFten times fusing with the iron warrior as the warp has them “become iron without” and they do not fight it nor, do they have any issue. now, imo I would re-frame the sorcerers as masters of signal and make things like “endless cacophony” and “tide of traitors” renamed as stuff like: “bring the iron to the stone” and ‘forward MEAT!” but that would be confusing for opponents and as a courtesy I have bothered to at least make sorcerer models proper.